India has blamed the previous seven breaches on the Kosi embankment on Nepal releasing water from the barrage at Bhimnagar, even though Nepal has no control over the sluice gates. All the earlier breaches had occurred downstream of the barrage. But this year the breach happened upstream of the barrage and the flow was less than what normally is during floods. So what caused the flood this time? It is a clear indication of lack of maintenance of the embankment, says D K Mishra, water expert and former Bihar engineer, who has been studying the Kosi since 1984. India is responsible for the upkeep of the embankment and the barrage on the Kosi in Nepal, under the Indo-Nepal Kosi treaty of 1954. "No one is talking about the silt load and the impact it could have on the embankment. The Kosi has an annual silt load of 94,400 acre feet. The embankment, which was build to hold 0.95 million cusecs of water, gave way when water was less than 0.14 million cusecs," says Mishra. The day the breach occurred, the water in the Kosi was 0.134 million cusecs at the breach point, while usually the river has 0.4 million cusecs during floods, according to Bihar's Water Resources Department. Anup Upadhyay, spokesperson for Nepal's Water Resources Department, said, "This is not a natural disaster as India is making it out to be. They did not carry out the repair work on the barrage and the embankment on time." Nepal's Prime Minister Parchanda said the Kosi treaty that invests the entire responsibility of design, construction, operation and management of the Kosi project for 199 years in Indian hands, was "a historic blunder". Former water resources minister of Nepal, Dipak Gyawali, told a newspaper that "the Kosi treaty is not right for managing this kind of trans-boundary river system". Gyawali said it left Nepal "absolutely no room to do anything except allow India to quarry all the boulders". In case it senses an emergency to repair embankments, Nepal can only contact the Bihar government. According to Upadhyay, Nepal had been informing the Bihar government for long that the embankment needed repair. "The Indian engineers who were supposed to come in the lean season, that is winters, did not come then. The Kosi treaty specifies it is the Indian government that investigates and estimates the charges. The problem of maintenance has been there for long and perhaps since the maintenance cost was too high, the Bihar government did not take any step," he said. In the past Bihar has conveniently blamed "not just the Nepalese government and the Maoists, but also rats and foxes for breaches in embankment," says Mishra. "The allegation that Nepal could have released water from the barrage is also wrong, since it is the engineers from Bihar who are posted at the barrage and are responsible for managing the sluice gates," says Anupam Mishra, a Gandhian and an environmental activist. Building embankments and the barrage, experts say, not only reduced Nepal to a bystander, it was also not the right response to curb floods in the turbulent Kosi. "The river flows down very steep peaks of the Himalayas, has a lot of current and carries a lot of sediments. It will not be wise to try contain the river either through embankments or a high dam as proposed at Barahkshetra in 1947," explains Anupam Mishra. He suggests a simple solution of investing in boats and training fishermen in rescue operations. "This region has a lot of fishermen and boat makers," he says. 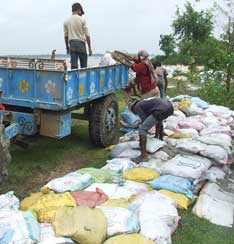 Preliminary findings of an independent, multi-disciplinary fact-finding team, which went to Bihar in March this year, revealed that the government's investment in embankments of over Rs 1,600 crore since early 1950s has only increased the flood-prone area from 2.5 million hectares (ha) during the pre-plan era to 6.9 million ha today. It is a near threefold increase. The fact-finding team comprised D K Mishra, development analyst Sudhirendar Sharma, ecological campaigner Pandurang Hegde, environmental researcher Gopal Krishna, river ecologist Rakesh Jaiswal and landscape architect Laxman Singh. 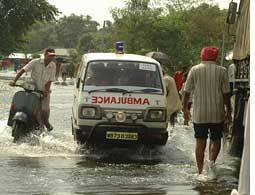 "Embankments are not the solution to taming floods in Bihar. It does not pay to tamper with the flow of a river that carries a heavy sediment load as Kosi does. Embankments along a river can actually result in a huge net loss in a single incident of breaching," says Eklavya Prasad of Megh Pyne Abhiyan. Embankments also destroy the natural process of building deltas and flood plains and raise the riverbed, says Prasad, adding that embanking the Kosi has led to a rise of 2 m in its bed in the lower reaches within 30 years of embankment construction. In 1962, when Bihar had 160 kilometres of embankments the flood-prone area was 2.5 million ha. In 2002, it had 3,340 km embankments and 6.9 million ha of flood-prone area, according to the fact-finding team. In Bihar, it estimates, one million people are permanently trapped between embankments and the Kosi. Embankments also block natural drainage channels, resulting in water-logging that has affected eight million people. The team also reported that "despite the failure of embankments to contain floods ... the business of embankment construction has resumed after a lapse of 17 years with a Rs 792 crore package to tame the Bagmati, one of the tributaries of the Kosi. There is another proposal to embank the tributaries of the Mahananda at an estimated cost of Rs 850 crore". The Kosi High Level Committee has cleared the Bagmati embankment project. The Union Ministry of Water Resources has even presented interlinking of rivers as a possible solution to floods in Bihar. "Building embankments that collapse with terrifying regularity has become a neat little money-spinning exercise, perpetuated by a nexus of politicians, contractors and engineers," says Prasad. On the Kosi, work has begun to repair the breach and bring the river back to its "old" route, within the embankment. It is worth noting that the Kosi has been changing course since 1736 and has moved westward by 120 km. "It should be understood that the river, due to its sediment and silt load, will continuously keep changing its course. It will change its course even if it has to break the embankment," says D K Mishra. Repairing the breach is, however, an immediate requirement. But the centre and state are giving conflicting statements on it. While the Bihar government says it is expecting to complete the work by March, Secretary for Water Resources U N Panjiar says the work of plugging the breach would be complete before October. "Right now we are only trying to freeze the ends to prevent further breach in the embankment. The breach will be plugged once the flow of the river reduces. That will happen only after November," said Pratyaya Amrit, additional commissioner, Department of Disaster Management, Bihar. Will the breach affect areas downstream of the flooded region? "There is not much impact on either West Bengal or Farakka barrage on the Ganga, since it is the normal flow of water. The water level hasn't risen in the Ganga. So there is no problem at present," says Panjiar. The Kosi has joined the Ganga at Kursaila in Bihar. Jaya Mitra, who has written on the Ganga and the Farakka barrage, however, warns that the eastward movement of the Ganga near Rajmahal hills due to sedimentation of its bed and the silting of the Farakka barrage can create trouble in the future.